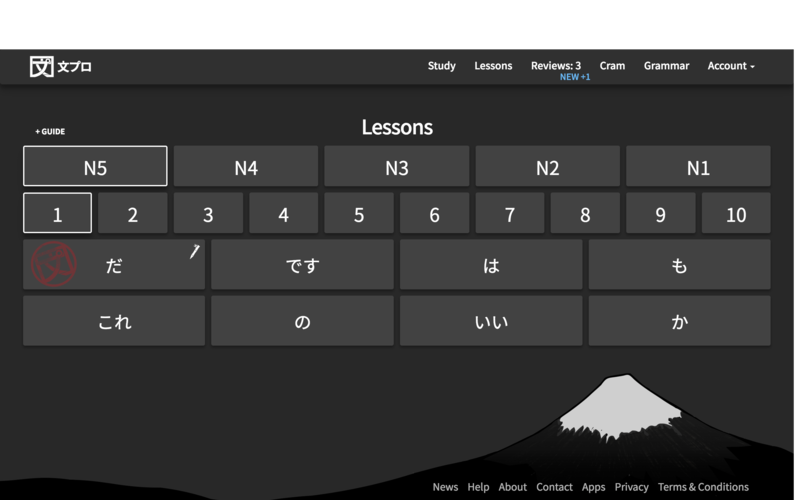 N3 Lesson 9 now has 12 example sentences and 12 review questions! 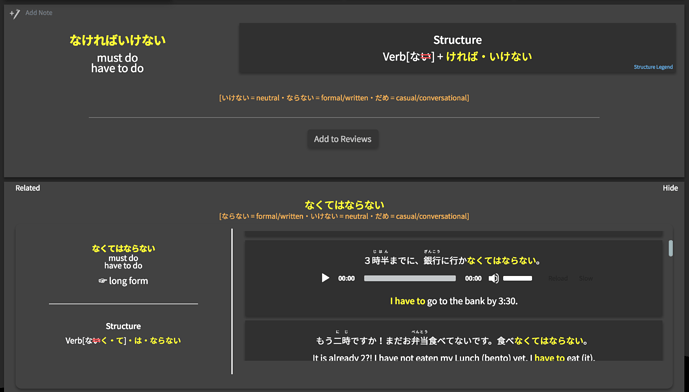 N3 Lesson 10 now has 12 example sentences and 12 review questions! This means that all N3 grammar points are now accompanied by 12 example sentences and 12 review questions. Cheers! N2, Lesson 7 is now available! 20 new grammar points to further your studies! After introducing a new look for Bunpro, we received a number of requests for a modern look with a darker color palette. Go to Account, Settings, Site Theme, and choose Modern Dark to try it out. Please let us know what you think! N5 and N4 lessons have now been populated with over 900 related grammar structures. Compare and contrast similar grammar structures, nuances, and example sentences side-by-side, all in the same window. New Audio - All of N4 now has audio accompanying each example sentence and study question! ・Japanese and English sentences that require two or more lines should no longer overlap each other. ・Notes no longer preserve styling when copying and pasting from other sites, which means they should now display normally and not interfere with any content on the grammar page. N2, Lesson 8 is now available! 24 new grammar points!